This Silicone Muffin Cups Kitchen Hack will help keep all of your muffin cups organized. Even your dollar store paper ones! I love these reusable Silicone Muffin Cups I found on Amazon. They are easy to use and I never run out of baking cups! Being a food blogger I am always trying out a new recipe, and muffins and cupcakes are common around here. It’s frustrating to be starting a cupcake recipe only to find out I am totally out of baking cups. So I picked these up a while back and can save that trip to the store. They also cut down on wastage and generating more trash. After I got these fun Silicone Muffin Cups I realized they can be an organization problem, since they are soft and don’t stack well. This can easily be solved by using a regular wide-mouth pint mason jar and just stacking the clean dry cups inside! I can now always find them in my pantry and I am not missing one or two somewhere in a drawer. If you have been wondering about these cups, I can recommend them. This set on Amazon is dishwasher safe. Typically I run them on the top rack of the dishwasher inside out. This helps the dishwasher actually clean them and also they are less likely to turn upside down and collect water. If you have a dishwasher with a utensil rack that folds over, it helps too. There really isn’t much difference in baking with these that I can tell. On heavier muffins you may have to increase baking time by just a couple minutes. But nothing I would edit any recipes for. Of course, if you’re taking cupcakes to work, church or an event, don’t leave them behind!! I usually just use mine at home so I don’t have to worry about losing them. I think my favorite thing about these is not having to hand wash that muffin tin! LOL! It’s always a pain. I think these can extend the life of nicer muffin tins too, since you’re not scraping the muffin tin clean every time. 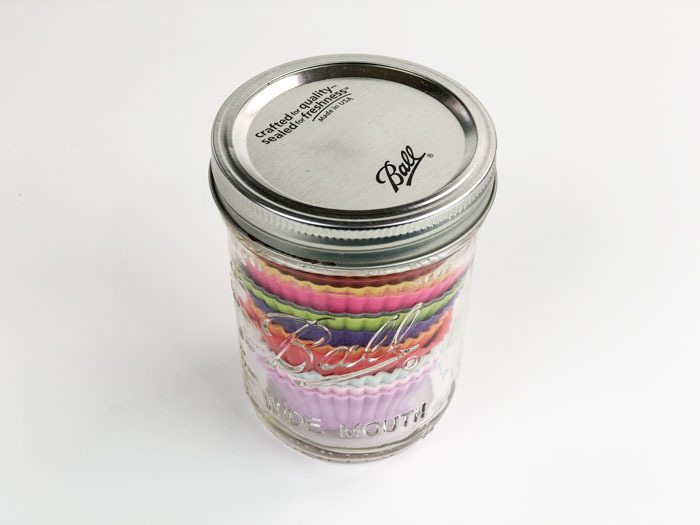 Finally, I have to add that the Silicone Muffin Cups look so colorful and pretty in this Mason jar– they would be a fun gift! So if you need a hostess gift, baby shower prize or anything along those lines, just throw this together with a fun tag or piece of fabric on top. So easy. Hope you found this useful, remember to comment on Facebook with your favorite kitchen hacks!